The President of the United States receives a late night call from Batman directing the President to create a "distraction". Green Arrow and Black Canary enter a bathroom stall and gain access to an underground lair where Batman is being taken to task for his kidnapping of Hawkgirl. Batman informs his team that Superman killed the Martian Manhunter. He also informs them that Superman and Lex Luthor are manufacturing superhuman technology at the Fortress of Solitude. He plans to steal the tech from the Fortress while Superman is distracted by US warships moving in towards the Korean peninsula, and takes Catwoman, Black Canary and Captain Atom for their various abilities; Captain Atom most importantly to defend against Superman. However, Superman cuts to the chase and confronts the President, asking him why he would make such a move, and quickly realizes that the President's move was a distraction. Superman quickly uses his vision powers and makes for the Fortress. Batman's team gains access to the Fortress, only to find Jon and Martha Kent there. Batman begins a Samurai retreat, but it's too late. Superman has arrived and he's wasted no time dispatching Captain Atom. Story - 4: Good issue. It does everything it needs to do and everything a fan would want it to as well. There are, of course, a few things here and there that make this issue less than what it could have been, but they will be discussed shortly and for now, good issue. In addition, there's the indirect commentary about Superman and Batman, and why their "rivalry" is pretty much a sham. The lacking aspects of the issue mostly revolve around Batman, who at this point in the story, is the bad guy. Superman, despite what we know about the Injustice video game, isn't guilty of any crime other than murdering the Joker; (litotes anyone?) He's done nothing wrong aside of saving the world from an invasion by Apokolips, and keep the Martian Manhunter from killing Wonder Woman. Batman's arrogant insistence that somehow he knows the future and what it will be under Superman only works if you know the future that is coming. Still, the Batman is the master planner and strategist, so we take him at his word because: he's Batman. It's the same when his team takes him at his word on Superman killing Manhunter, as he withholds that Manhunter was trying to kill Wonder Woman, just as he withheld his reasons for abducting Hawkgirl. Batman somehow has the President of the United States (who is conveniently having an affair) in his pocket, and can coerce POTUS to commit troops to be a distraction while he infiltrates the Fortress of Solitude. It's just too much at the end of the day. Fortunately, it doesn't detract from the overall story. It was refreshing to see Superman not fall for the gambit Batman was playing, and for him to be the one person not attached to the strings of the Bat other than Green Arrow. Actually, if I was a Green Arrow fan, I'd be very disappointed in his rendering for Injustice. I don't know the character very well, but I doubt he's as thick as Taylor is making him out to be. That being said, Superman has the mind to sort the problem out at the source, and before a lengthy discussion can ensue, he sees the maneuver for the ploy that it is. The look on Batman's face when he sees the Kents is priceless. He looks like he made guano in his utility belt. He's erred and badly and needs to get outta Dodge. When Superman arrives, and has taken out Captain Atom in the few seconds that he's been there, one felt the need to stand and applaud. Captain Atom is no match for Superman, though he's purported to be because of his ability to project red solar radiation. It's similar to the Kryptonite argument with Batman and both are flawed from stem to stern. Red solar radiation doesn't rob Superman of his powers, not when he's had a yellow sun to off-set Captain Atom's attacks, and rather than show this, it was good to see Superman with the defeated Captain Atom and save the reader the four panels of foregone conclusion. Batman's plan has gone awry and now he has to contend with Superman, who has specifically told him to stay out of the way. Batman will never be able to explain that he was there for the tech, not for the Kents, not after abducting Hawkgirl. It's interesting that all it takes for Superman to be a match for Batman, is for Superman to distrust Batman as much as the former does the latter. Regime Superman will never give Batman the benefit of the doubt, and without that wee bit of grace, Batman cannot match Superman at all. It is annoying that the only way for Superman to put Batman in his place is for him to be evil. Good Superman, as we saw back in issues 1-4, needed Batman just to call the League to help find Lois. 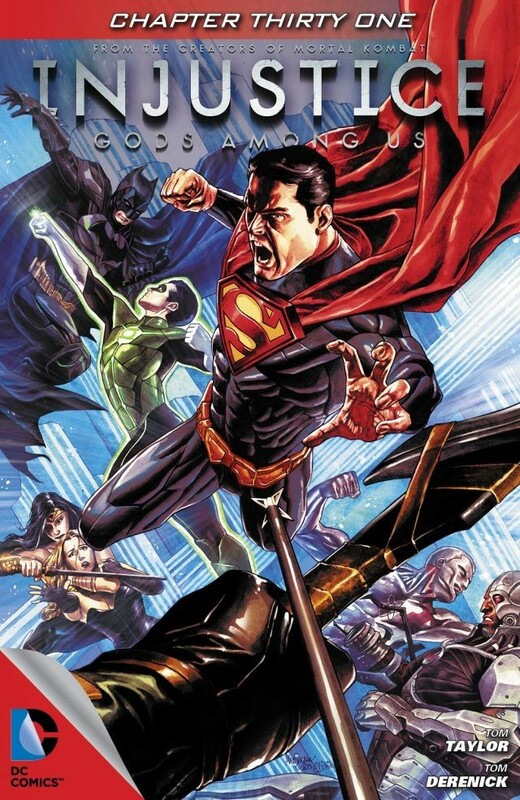 No one reading Injustice believes for one instance that a Kryptonite ring will save Batman from Superman's wrath, so the next issue is even more precious, as it will show how this confrontation is resolved. Personally, I would love to see Superman wreck Batman decisively, but then I remember that Regime Superman is all the things about Batman that I've grown to dislike, even though I love the character. He's curt, cynical, arrogant, and is a threat to those closest to him. Batman as a friend is the man who can have his colleagues defeated with planning; however, it will be interesting to see how that still holds when he's not seen as a friend. Art - 4: Derenick is back and it makes for a better issue as he has the best handle on drawing Regime Superman. There is a distinct difference in how Superman looked in issue 30, as opposed to the current installment. Derenick renders Superman so that the weight of his actions can be seen in every facial expression. Cover Art - 2: Green Lantern looks like he should be in Batman Beyond, while everyone else looks like they were pulled from an advert for Target.